J.B. Carr Fever; The JB Carr, 1st. Leg. is away in Tipperary on Tuesday 23rd. The fever has started, as much support as possible will be appreciated to encourage the team to another victory. Any further details Contact Team Manager; Liam Leahy. 087-4115773. Saturdays & Sundays Competition; The 18hole Stableford on Saturdays and Sundays will be in full motion after the spring league. Link up with other available players by using the Club “Whats App” . 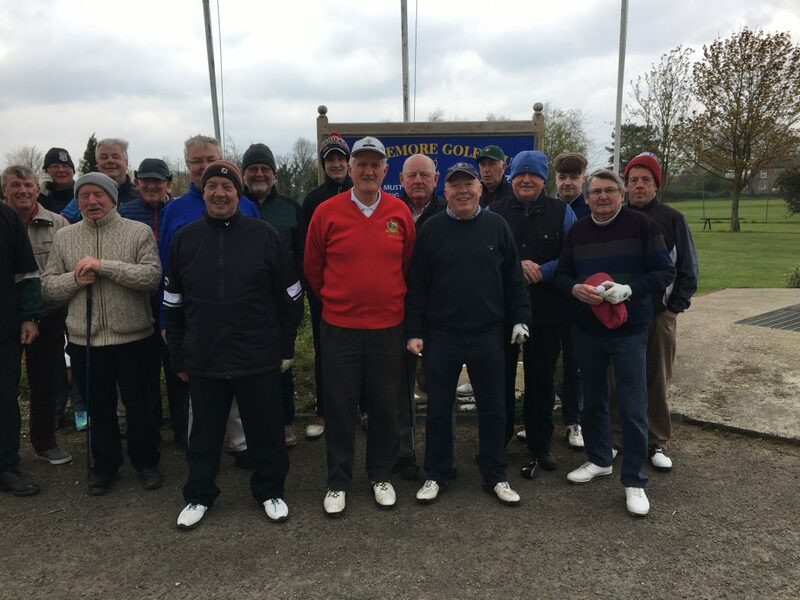 Whyte Dowling Golf Society; Templemore Golf Club Hosted the Renowned Whyte Dowling Golf Society on Saturday 13th. It was the Society 1st outing for the 2019 Season. There was a fantastic turn out for the event. All lauded the fantastic condition of the course and acknowledged credit to all the course team on the magnificent development work on the course. Mixed Social Golf; The Social Mixed Golf will now be continued every Wednesday Evening, Registration pre-6pm with start time when ready to avail of day light. The 1st Mixed of the season was on last Wed. 10th. April. There was a present turn out despite the short notice and it was great to see the combination of Ladies and Gents out on the course. And the Lady’s food and beverage reception afterward was fantastic. The winning team was; Kay Brennan Seamus Bourke, Tom Kennedy. New “Cadet” Section; There will be a collective vetting night shortly, All members Ladies and Gents who want to be involved in this great project for the future of the club will have to complete a “Vetting Form” it would be fantastic if, as many as possible would support the development of the Cadet sector in our club under the guidance of CGI, (Confederation of Golf Ireland) please contact Pat O’ Connell. 087-9205821 Club Juvenile Liaison Officer. The signing date will be listed on the Members WhatsApp Later. Juvenile Golfers; All current Juvenile golfers are encouraged to continue with their game during the Easter School Holiday breaks. When the CGI Cadet Section is established it’s envisaged that there will a training session once every week. If any assistance is required, contact; Pat O’ Connell. 087-9205821 Club Juvenile Liaison Officer. Special Fee for Beginner Golfers. There is a “Special limited Fee” for beginners which is guaranteed not to change for 3 years. This is very attractive for anyone interested in joining and for those purchasing vouchers to give a life changing experience to someone. New members are now been accepted. The membership categories have been increased to suit all sectors of the community. All current members are encouraged to introduce at least “ONE NEW MEMBER” Lady or Gent, Junior or Student, Seniors Juveniles and Family, Active Retiree’s, Special Needs or any person interested in taking up the sport. It will be a huge advantage to building the club membership and profile. A big welcome to Lapsed Members; A special rate for “Lapsed Members” that have not played/joined for “One Year” can avail of a “welcomed back” once-off, special rate of €200 and Ladies €170. This is a great motivation opportunity for golfers, Ladies and Gents who want to return to this great social game. All current members are encouraged to promote this offer to help those that want to return to the Club. Registrations Forms are now available on-line on our web site, just select the “Membership” tab and it will give you the option to pay by Pay Pal or Credit Card. or collect an application form at the club house or contact Martin Bohan 087 0509278 or any of the committee members. Payment options can also be made through the Golf Club web site link; http://templemoregolfclub.ie/membership/ All will be more than welcomed. Golf can be a Life Changing Gift; Give a life changing Sport experience to someone. The Ideal gift for anyone who would like to take part in an active exercise sport. Golf is that Ideal Gift. Buy a membership Voucher now. Contact Martin Bohan 087 0509278 or any of the committee for to purchase the “Ideal Active Present”. Course Development; Donations, sponsorship, will be greatly received and used exclusively for Course Development. Put your stamp on the course making a special contribution. For Donations, Just select the “Membership” tab and then select “Make a Donation” tab on the Club Web Site http://templemoregolfclub.ie/membership/ , or in confidence contact; Martin Bohan 087 0509278. The Seniors Golf; Thursday April 11th. The popularity of this is evident in the fantastic turnout of Seniors due to the continued improvements on the course. Lapsed Senior Members; The Seniors is an ideal opportunity for “Lapsed Members” to return to the club. There will be a great “Welcome Back” for them, also, great team support, banter and refreshments. “Make your return to Golf Now”. Call in on Thursday mornings at 10am. To play or at 12noon approx. for to join in the Cuppa and Banter. Winners; The winners for Thursday 11th. were; 1st. Team; Tom McGrath, Pascal Whelan, Donal Golden, Mick Murphy . 2nd Team; Seamus Bourke, Frankie Shortt, James Murray, J. Keogh. 3rd. Team; Bertie Keane, Pat Costello. George Murray, Tom Kennedy..
Next Seniors; Thursday April 18th. Next Seniors Away; Tipp Town. 25th.. April. LMC; Next LMC Wed. May1st. Tullamore. Spring League; 5th. leg. Conclusion Date, April 22. Saturdays & Sundays Competition; The 18hole Stableford on Saturdays and Sundays. Use the “WhatsApp” to link up with other players. JB Carr; 1st. Leg. Away, Tipperary-V- Templemore, to be completed no Later than Tuesday April 23. Contact Manager; Liam Leahy. 087-4115773. Sunday April 28 ; Munster Country Clubs Cup, At Doneraile Golf Club, Round 1-Spanish Point-V-Templemore. Manager; Liam Leahy & Dinny Touhy. Sunday May 12 ; Fred Perry Trophy.. Over 55yrs., No Handicap Limit, Combines 42max. Round 1-Tipperary-V-Templemore. Manager; Seanie Gleeson. Saturday May 25 ; AIG Pierce Purcell Shield, At Clonmel Golf Course, Round 2- Ballykisteen-V-Templemore. Manager; Mick Keely. Sunday June 2 ; Cashman Cup. Munster Club Four-Ball Championship. Round 1- Cahir Park-V-Templemore. Manager; P.J. Leahy. Thursday June 13 ; Irish Mixed Foursomes, Tipperary Golf Club, Round 1-Templemore-V-Ballykisteen. Managers; Captains; Captains Tony O’Toole, Lorraine Ryan/Seamus Bourke. Classic Fund Raiser; Fri 6th. Sat 7th. Sun 8th, July. Presidents Prize; Sunday July 28 . Captains Prize; Friday, Saturday, Sunday August 16,17, 18 . White Dowling Society; Saturday October 26. White Dowling Society; Saturday December 14 .